The Huffington Post India, a widely circulated news aggregator, features Cupick. Techportal features an article on Cupick’s funding. Cupick’s funding covered on Indianweb2. The Business Insider features Cupick in an article. Livemint features news on Cupick’s funding. Dealcurry.com features an article on Cupick’s funding. Techcircle.in publishes an article regarding Cupick’s funding. Cupick’s funding featured on Inc42 magazine. TechInAsia features news of Cupick’s funding. Cupick featured in The Economic Times, a leading business paper in India. e27 which covers emerging and disruptive businesses across the region, writes about Cupick. Hindu Businessline, one of the most widely read business papers in India, writes about Cupick. 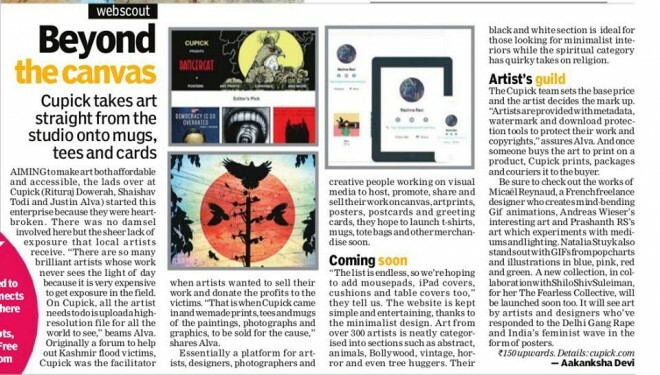 Also featured in PolkaCafe.com, Midday, The Banging Beats and other publications. The Economic Times, India’s leading business publication, writes about Cupick. We made an appearance on the homepage of their website under the segment ‘Emerging Enterprises’. Jabong.com’s magazine covers the Design for Kashmir initiative which is powered by Cupick. They also gave us a mention. Cupick featured in a list of 22 startups that got the attention of editors at TechinAsia.com, a leading platform covering startups in Asia.